When independent international investigations are called for lip service is paid to the need to delve into the conduct of “both parties”. In the absence of a tangible LTTE leadership that can be targeted such references are mere abstract notions rather than concrete realities. The phenomenon of Tamil Diaspora leaders, representatives and activists being re-born as Independent “avatars” seeking justice and accountability is all the more galling when the recent past is recalled. The role and conduct of the LTTE and pro-LTTE elements within the Tamil Diaspora has played an extremely negative role in plunging the community into disaster. Yet these persons are now able to project themselves in a new image without feeling pangs of guilt or expressing any remorse for the past.
" During the latter stages of the war when the army advanced and tigers retreated, the shrinkage of the LTTE sphere of control in the island resulted in the reduction of the Tigers’ revenue base also. Thus, the Tigers who had at one time ridiculed the Diaspora were compelled to rely more and more on funds raised from it "
These elements have learnt from previous blunders and are now re-configuring themselves in seemingly positive formations. 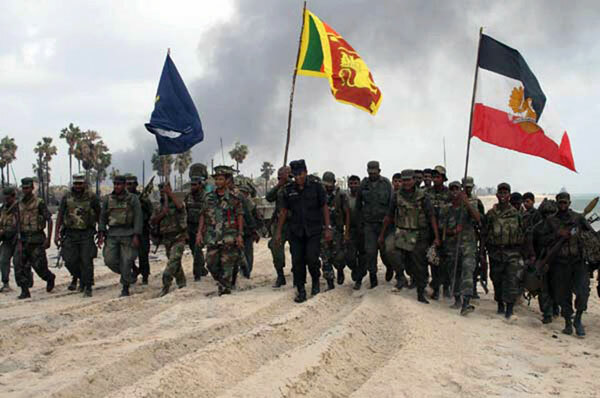 The Diaspora that was unable to prevent the LTTE military defeat in Mullivaaikkal is now trying to extract revenge by advocating International action against Sri Lanka. The role of the Diaspora was most despicable in the final phase of the war. Yet the same elements in fresh garb have assumed new roles. I have in the past written extensively about the LTTE and pro-LTTE activities within and outside Sri Lanka but it would be pertinent to draw on those writings to provide an insight into current developments.
" 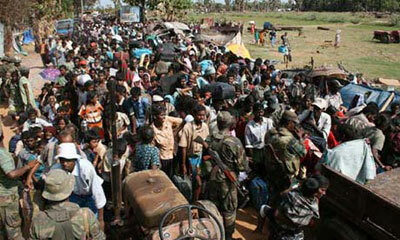 A former LTTE spokesperson told a German journalist that the expatriates were economic refugees. The LTTE “poet laureate” Puthuvai. Rathinadurai in a poem called them dogs "
In 1989, I attended a conference organised by the pro-Tiger publication Tamil Voice International in London. Among the participants were politicians, journalists and bureaucrats from India such as P. Upendra, S. Unnikrishnan, Aladi Aruna, N.V.N. Somu, K. Veeramani, A.P. Venkateswaran and Samantha Datta Ray. Liberation Tigers of Tamil Eelam (LTTE) leader Velupillai Prabakaran sent a felicitatory message to the conference. The delegates, consisting mainly of members of the worldwide Sri Lankan Tamil diaspora, were shocked by a reference in that message. Prabakaran described the Diaspora as “tholaintha santhathi” or lost generation. The Diaspora representatives were seething with anger but were unable or unwilling to challenge the Tiger supremo’s poor opinion of them. Despite members of the Diaspora playing an important role in the affairs of the LTTE, that organisation regarded those who had “left the homeland” (pulam peyarnthor) generally with contempt. The LTTE described them as people who had deserted “Tamil Eelam” at a critical juncture. A former LTTE spokesperson told a German journalist that the expatriates were economic refugees. The LTTE “Poet Laureate” Puthuvai. Rathinadurai in a poem called them dogs. That opinion began to change as more and more Tamils left Sri Lanka as refugees to swell the numbers of a global Diaspora. Even as contributions to the LTTE decreased at home, the funds from abroad increased. The LTTE fund raising mechanism operated abroad generally in five modes. The first was the mode known as “SO” or Standing Order. This is a method by which committed supporters of the LTTE make arrangements through their banks for a monthly sum to be sent directly to the front organisation of the LTTE in his or her country. This is a comparatively small sum but has regularity guaranteed. There is no coercion in this because those who contribute are genuine supporters who do so willingly. The funds raised through this method are used for the running of LTTE branches/fronts in each country. The second was the annual general collection. This is a collection drive executed on an on-going basis throughout the years. In this, Tamils regardless of whether they are active supporters or not are targeted. Pledges are extracted for certain sums of money to be paid in a few installments. Force, intimidation and coercion were used frequently in these collections to make people pay up or increase the sums of money promised. An easy way of frightening Tamils was by threatening harm to family members living in Sri Lanka. A large number of people paid up willingly too. Earlier tiger collectors used to work on a voluntary basis but later the collectors were paid a commission depending on the amount they collected. This incentive resulted in a massive increase in the fundraising. At the same time enthusiastic collectors engaged in violence and intimidation to increase the amount collected as their own income through commissions too increased proportionately. The money raised through these collections was spent in three ways. A substantial portion of it was sent to the LTTE headquarters in the Wanni for maintenance and upkeep of the movement. Another portion was sent to procurement agents abroad for arms and ammunition purchases. A third and perhaps the largest portion was used for investment and setting up businesses abroad. The third form of fund raising was the one known as “Special collection”. This is actually a kind of credit or loan arrangement used exclusively to facilitate the acquisition of arms. This concept was pioneered by Selvarasah Pathmanathan alias KP decades ago when he was in charge of the LTTE overseas procurement or arms purchases. What had happened then was that huge amounts of money were required at short notice to make arms purchases. KP who was then in overall charge of overseas LTTE administration and fund-raising hit upon the idea of a special collection to raise funds at short notice.
" That opinion began to change as more and more Tamils left Sri Lanka as refugees to swell the numbers of a global Diaspora. Even as contributions to the LTTE decreased at home, the funds from abroad increased "
A special collection was one where trusted, diehard supporters of the LTTE in each country particularly those whose credit was good with banks, would obtain loans in their names and then transfer the money to the local LTTE agent or front. In most instances they would use their line of credit or put up their houses as collateral to raise loans. By this method a huge amount of money would be secured rapidly and utilised for arms purchases. The interest due to the banks for these loans would be given by the local LTTE branch through the funds obtained through Standing Orders. While the interest was paid off regularly in this way the principal was also paid off gradually through the money raised by the general collection. KP made sure that all the loans procured by tiger supporters in their personal capacity for a special collection was paid off in due course without default. His successors too followed suit. Thus the special collection idea caught on among LTTE supporters and exceedingly large amounts were raised and paid off without mishap. A special collection was usually undertaken once in eighteen months. Apart from these, there were two other broad methods to generate funds. One was by staging performances and shows and by selling stuff like calendars, videos, DVD’s, Audio CD’s, books, magazines, newspapers, souvenirs etc. Money was also raised by staging Black Tigers’ day and great heroes’ day celebrations too. On the one hand people were charged large amounts for admission while on the other people were also asked to make donations to cover the expenses. Finally there were the investments in commercial concerns. The LTTE justified its entry into pure commercial pursuits by stating that avenues of regular income should be ensured to sustain the armed struggle at all times. Since reliance on contributions alone could prove unsteady in the long run the tigers needed to set up commercial enterprises on a wide-ranging basis, it was argued. During the latter stages of the war when the army advanced and tigers retreated, the shrinkage of the LTTE sphere of control in the island resulted in the reduction of the Tigers’ revenue base too. Thus, the Tigers who had at one time ridiculed the Diaspora were compelled to rely more and more on funds raised from it. With the LTTE getting gradually boxed into a tiny strip of coastal territory in the Assistant Government Agent division of Karaithuraipattu in the Mullaithivu district, the endgame for the Tigers began. The fate of Prabakaran itself became a big question mark. Desperate, the LTTE turned to the Diaspora. The wheel had turned full circle. The LTTE claiming to liberate the Tamil people now started looking to the “pulam peyarnthor” to extricate itself from the morass it had sunk into. It was felt that only high-level pressure exerted by the international community could compel Sri Lankan President Mahinda Rajapaksa to call off the offensive and enter into negotiations with the LTTE. The Tigers gasping for breath, needed oxygen. For this task, the LTTE hierarchy thought that the Tamil Diaspora would be the trump card. Sections of the Diaspora in Western countries would mount pressure on their respective governments and make them pressurise Colombo. The Tiger lobby in Tamil Nadu was expected to do the same in India. An international campaign focusing on the plight of Tamil civilians in Tiger-controlled territory was to be orchestrated. Charges of genocide were raised. The objective was to use the civilians’ plight to pressure the international community into fulfilling its responsibility to protect civilians. The Tigers who were known for grave political miscalculations, were way off the mark in this too. While being sympathetic to the tragedy, the international community had a different take on its causes and possible remedy. The unwritten consensus was that the LTTE was primarily responsible for the Tamils’ plight. The bulk of the Tamil people were being held against their will by the Tigers. As such the crisis amounted to a “hostage” situation. The best option, therefore, was for the LTTE to release the civilian hostages and discuss terms of surrender. But then the LTTE, known for its disconnect with political reality, opted to go along the doomed course. The Tigers, underestimating the collective intellect of the international community, resorted to stratagems that were patently obvious.
" The “civilian plight card” by LTTE had outlived its usefulness. The confrontational course of affirming solidarity with an organisation banned in many Western countries and expressing loyalty to a man like Prabakaran as “national leader” did not go down well with the mainstream opinion in the West "
A new, different pattern was discernible. For the first time in many years, demonstrations and protests were being staged in Western capitals and important cities without two familiar items. One was the portrait of tiger supremo Prabhakaran and the other the flag with the image of a roaring tiger symbolising the LTTE. They were conspicuous by their absence. A harsh reality in recent times was that no significant public demonstration or meeting of a political nature could be convened or conducted by anti-Tiger or non-Tiger sections within the Diaspora. Though low-key events with adequate security arrangements were held occasionally by persons independent of the LTTE, it was virtually impossible to organise something “political” on a large scale. Such was the LTTE’s grip on the Tamil Diaspora. With the Tigers enjoying a monopoly of large-scale “public politics”, most demonstrations and meetings organised by the Tiger and pro-Tiger elements usually saw an abundance of placards with Prabakaran’s picture and flags with the Tiger emblem. Against this backdrop, it was indeed a noteworthy deviation from the norm when large-scale political demonstrations and events began proliferating amidst the Tamil Diaspora without these familiar objects. The reasons were not hard to seek. Fundamentally it was a change of tactics dictated by the politico-military circumstances in northern Sri Lanka. The situation “back home” for the LTTE was bleak. Realising fully well that the writing on the wall was clear for the LTTE if this trend continued, its supporters and sympathisers began orchestrating a campaign to “save the Tiger”. In what seemed a tactical yet puerile manoeuvre to hoodwink the world at large, the lead role in these efforts was delegated to students and youths who were not openly identified as LTTE supporters. Well-known LTTE elements adopted low profiles. In a further bid to show that the demonstrations were not LTTE-oriented and that the concern displayed was altruistic in purpose, the tell-tale signs of Prabakaran placards and Tiger flags were dispensed with. The demonstrations were shown as being expressions of concern about the civilian plight. That this humanitarian concern was only a facade was exposed by four factors. First, no such concern was shown when civilians in the Eastern province were in distress owing to the military campaign or even when civilians in the north-western regions of Wanni were affected. It was only when the LTTE-dominated north-eastern enclave was under threat that this cacophony for civilian concern increased in volume. Secondly, these voices were stridently loud about the damage and destruction caused by artillery shelling and aerial bombardment by the armed forces but were conspicuously silent on the atrocities committed by the LTTE against its own people. There was no condemnation of the Tigers endangering civilian life, limb and property by locating their artillery and mortars in thickly populated places and engaging the enemy, thus bringing about inevitable retaliatory attacks. Thirdly, there was no criticism of the LTTE for preventing sections of the people fleeing its territory for safety reasons. The LTTE has killed and injured several civilians for daring to escape its clutches and seek Army protection. Only the armed forces were blamed by these sections of the Diaspora. Fourthly, these sections wanted a permanent ceasefire. The United Nations had called for a temporary ceasefire to help facilitate the humanitarian exercise of evacuating entrapped civilians. But the pro-Tiger elements agitating for civilian protection were not responsive. They wanted a permanent ceasefire to safeguard the LTTE. Their intention was to let the LTTE survive further by bringing about an end to the military campaign. They also wanted the entrapped civilians to remain as human shields in Tiger areas rather than obtain safety and relief in government-controlled areas.
" The unwritten consensus was that the LTTE was primarily responsible for the Tamils’ plight. The bulk of the Tamil people were being held against their will by the Tigers. As such the crisis amounted to a “hostage” situation. The best option, therefore, was for the LTTE to release the civilian hostages and discuss terms of surrender "
While these frantic attempts were on, Colombo seemed to be firm that the military juggernaut should keep on rolling forward until the Tigers were firmly dislodged from their positions and the LTTE’s remnants were chased away. The only way the government’s resolve could have been weakened was through Indian or international intervention. Despite the endeavours of pro-Tiger elements and the well-meaning concern shown by human rights organisations there was very little hope that the military campaign would be called off. At best, there could have been a “humanitarian pause” to facilitate evacuation of civilians but a permanent ceasefire seemed unlikely. This was the real situation then. However much the Tiger elements protested and demonstrated about the civilian crisis, neither Colombo nor the international community was prepared to budge. Whenever the demonstrators evinced concern for civilians, they were informed directly and indirectly that the best option was for the LTTE to send civilians out and that arrangements could be made for that. Meanwhile, tensions emerged within the Tiger ranks abroad. The “old hands” got jittery that the “leadership” role was slipping away from their hands to new sections. They were becoming increasingly irrelevant in a “Tiger-free” environment. Resentment at their enforced “eclipse” grew. The hard-core Tiger elements also became unhappy. These emotion-driven sections are usually devoid of logic and reason. Their usual role is to generate heat and not to shed light. These people started protesting against the new decision to “blackout” the leader and the flag. They remonstrated that it was a betrayal of the struggle. Aggravating this situation was the cold war between Veerakathy Manivannan alias “Castro”, the accredited head of the LTTE’s overseas branch administration and the newly appointed global Tiger chief Selvarasa Pathmanathan alias “KP”. While KP advocated the “soft” approach of focussing on the civilian predicament, Castro, unwilling to relinquish his power, fomented revolt against the diktat through his hard-line loyalists. In this situation, the LTTE hawks within the Diaspora gained the upper hand. The earlier, comparatively sensible, approach was jettisoned. Instead, a defiant but unwise decision to pursue a confrontational course was adopted. With this change, the focus shifted. The crocodile tears shed for helpless civilians dried up. The demonstrators and protestors began singing a different tune. Instead of lamenting about innocent civilians, they began demanding that the Western nations lift the ban on the LTTE and formally recognise it as the sole representatives of the Tamil people. The placards showing scenes of suffering civilians and slogans urging international intervention were replaced by ones supportive of the LTTE. Placards with Prabakaran’s portrait were displayed at demonstrations with the slogan “Our leader Prabakaran”. Tiger flags fluttered proudly as crowds chanted “LTTE sole representative”. There was a cosmetic change in the flag. The two rifles at the bottom went missing in some. The glib explanation was that the flag with a roaring tiger sans the firearms was the “Tamil national flag”. The official flag of the LTTE until then had the image of rifles on it. In one swift move, the LTTE exposed its true colours. The Diaspora demonstrations now openly identified themselves with the Tiger cause. The poor civilians were abandoned. When demonstrations focusing on the civilian plight were held earlier there were signs of a slow but gradual growth of sympathy for the tragic Tamil civilian plight among the governments, people and the media in the West. An important reason for this was the absence of Tiger symbols and emblems in the public demonstrations. The problem was being viewed in humanitarian terms and a possible change of heart may have evolved. The logical and humanitarian course to be adopted by the Tamil Diaspora was to have persisted with its earlier role of focusing on the civilian predicament alone. Shifts in public opinion take time. Though not definite a possible change may have been on the cards. Instead, the LTTE hierarchy blundered in a typical fashion by readopting its earlier hard-line stance. Complicating matters further were consistent media revelations that the LTTE was holding the bulk of civilians against their will and had even brutally punished those trying to escape. Since the pro-tiger demonstrators glossed over or denied the infamous conduct of the LTTE international public opinion could not be swayed. The “civilian plight card” by LTTE had outlived its usefulness. The confrontational course of affirming solidarity with an organisation banned in many Western countries and expressing loyalty to a man like Prabakaran as “national leader” did not go down well with the mainstream opinion in the West.
" They wanted a permanent ceasefire to safeguard the LTTE. Their intention was to let the LTTE survive further by bringing about an end to the military campaign.They also wanted the entrapped civilians to remain as human shields in Tiger areas rather than obtain safety and relief in governmentcontrolled areas"
This trend in public opinion became more and more visible. Media coverage began dropping in quality and quantity. Mainstream Western politicians, except for a few, started avoiding demonstrations and meetings where Prabakaran placards and Tiger flags were displayed. In spite of massive demonstrations, paralysing traffic at times, most mainstream Western politicians particularly those holding political office avoided any public identification with demonstrators. At one point demonstrators started playing childish games like folding up Tiger flags for periods of time to enable politicians to show up at demonstrations and raising them again when expected leaders did not turn up. Things took a turn for the worse as the LTTE declined further back home. A new “militancy” was displayed abroad. Committing self-immolation, going on fasts unto death, stopping traffic on public roads, storming public departments and Ministry buildings, protesting outside embassies, high commissions and consulates, throwing rotten eggs and tomatoes, vandalising Sri Lankan and Indian diplomatic missions and other acts in similar vein started spreading. A disturbing trend was the tendency on the part of young activists to confront the law-enforcement authorities. There were also incidents of friction with members of the Sinhala Diaspora who had commenced counter-demonstrations. A tactical blunder by the Diaspora then was its ethno-centric approach to what was essentially a humanitarian catastrophe. If it had dispensed with its Tiger-oriented agitation and altered the focus to that of a human rights perspective there were vast possibilities of attracting many human rights organizations also into joining the demonstrations. But the LTTE flavour prevented such a wider mobilisation. This short-sighted conduct of the LTTE within the Diaspora was just one more instance of the irreparable damage inflicted upon the Tamil people by the Tigers. After having brought Tamils to the precipice of disaster in Sri Lanka, the LTTE was unable to prevent the inevitable debacle that unfolded on the banks of the Nandhikkadal lagoon in May 2009. Even though the LTTE received the death blow in Sri Lanka its overseas structures were not affected. Its branches, fronts, businesses and media organs functioned as usual. Despite internal squabbling the Tiger and pro-Tiger sections of the Tamil Diaspora continued to espouse the Tamil Eelam cause and fly the Tiger flag wherever possible. In a deceptive move the claim was made that the Tiger flag was not that of the LTTE but that of Tamil Eelam. Misrepresentations were made to sections of the mainstream media abroad and a new generation of non – Tamil speaking Tamil youths that the roaring Tiger is the Tamil national flag. The LTTE and pro-LTTE elements abroad lost considerable power and clout after the military defeat of the LTTE in 2009. Internal dissension and factionalism has caused much damage to the movement. A striking example of this is the pronounced antipathy displayed by the one –time Tiger media flagship “Tamilnet” towards the Transnational Tamil Eelam Government of its self – styled Prime Minister Visuvanathan Rudrakumaran. Gone were the days when the LTTE could mobilise thousands of flag-waving demonstrators at short notice in important Western cities. A large number of Tiger media organs have ceased to operate. Fund raising has not completely dried up but has certainly dwindled. Many “benami’s holding or managing property and enterprises owned by the LTTE have begun “appropriating” them or selling them and running off with the money.
" These people who justified every action of the LTTE including the assassination of those with different opinions have now become champions of human rights. They shamelessly align themselves with reputed human rights organisations like Amnesty International, Human Rights Watch and International Crisis Group and talk of human rights "
Hilarious too was the overnight transformation of many “educated” Tiger supporters with high academic and professional qualifications. These people who justified every action of the LTTE including the assassination of those with different opinion have now become champions of human rights. They shamelessly align themselves with reputed human rights organisations like Amnesty International, Human Rights Watch and International Crisis Group and talk of human rights. Another feline species that has emerged abroad after the decline of the LTTE in Sri Lanka are the “Internet Warriors”. A whole range of websites and e-mail groups have been formed. The websites publish mostly fabrications and outright lies about the situation in Sri Lanka. The e-mail warriors continue to exchange fiery missives among themselves hoping and yearning for the collapse of the Rajapaksa regime and resurrection of the LTTE. The collision course between the Rajapaksa regime and influential members of the international community of nations was like Manna from heaven to these tiger elements. The interest shown by sections of the western media and reputed human rights outfits on the plight of Tamil civilians also provided a boost. They seized the opening available. Instead of making the mistake made in the last days of the war the Diaspora elements now shunned the LTTE trappings and took on fresh attire as concerned activists for justice, accountability and human rights in Sri Lanka. Colombo’s mishandling of international relations has provided the Diaspora tiger elements a new lease of life in a different avatar. The LTTE was now cosying up to those who criticised them earlier while the Rajapaksa Govt was becoming critical of the international community. Sri Lanka criticising the international community and media as being manipulated by the LTTE has helped enhance the tiger image and stature amidst the Tamil Diaspora. In Tamil folklore and everyday usage, there are many sayings and references about the tiger. “Pasuthhol porthiya puli” is one such descriptive phrase, which means the tiger covered in a cow’s skin or hide. Metaphorically, this alludes to something fiercely dangerous portraying itself as harmlessly docile - an equivalent of the English idiom “wolf in sheep’s clothing”. An interesting phenomenon within the global Tamil Diaspora now is the carnivorous tiger attempting to portray itself as a herbivorous cow. This then is the unfolding saga of the LTTE where its overseas activists are now transformed into human rights champions seeking justice and accountability.